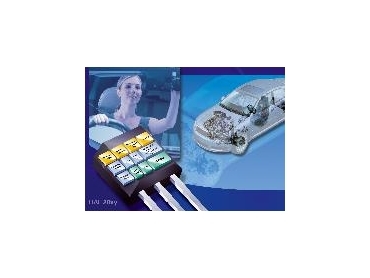 Micronas products for automotive and consumer electronics are available through GLYN High-Tech Distribution . Micronas have announced the HAL 28xy series, a family of hall-effect sensors, optimised for automotive and mechatronic applications that demand accuracy and flexibility combined with low cost. The HAL 28xy is the first Hall-effect sensor family to include a RISC processor for digital signal processing, a temperature sensor, advanced on-chip compensation and a digital interface. The latest automotive designs require smart sensors to deliver the high level of precision and robustness linked with the capability of local pre-processing of the measured data. HAL 28xy devices meet these needs with a programmable on-chip microcontroller that makes each device more adaptable and more accurate and provides diagnostics for additional reliability and ease of service. The digital interface reduces component and wiring costs, making HAL 28xy family members cost-effective for applications such as seat-track position and fuel-level sensing. According to Peter Zimmermann, Market Manager Automotive at Micronas, the HAL 28xy family is highly flexible, offering a fast implementation scenario for new output formats. With the built-in RISC processor Micronas are able to offer customer-specific signal processing. This flexibility allows OEMs to save time and money in the development cycle. The key to overall accuracy are three types of error correction. The Hall-effect sensor and on-chip temperature sensor have their own analog-to-digital converter (ADC). The ADC allows the microcontroller to perform spinning-current offset compensation, plus first-order temperature compensation for hall offset error and second-order temperature compensation for overall Hall-effect sensitivity. The on-chip EEPROM makes it possible to store custom individualised application parameters in each device. The implemented bus interface in the HAL 28xy series can drive the serial bus directly because the bus-driver is fully integrated. Both the power supply and the serial bus connections are protected by over-voltage devices. Family members include devices with LIN bus, used for most interior and passenger comfort applications, SENT, targeted for engine management, and PWM, addressing power steering applications. Along with the HAL 28xy, Micronas offer an easy-to-use application kit containing a programmer board, LabVIEW programming software and the necessary source code. Key application variables such as sample rate, magnetic field range, sensitivity, offset, and the temperature coefficients of sensitivity and offset can be adjusted by programming the non-volatile memory. Programming is done through LIN frames or BiPhase-M telegrams, depending on the family member. All HAL 28xy family members are offered in a TO-92UT package rated for use from -40 to +140°C.